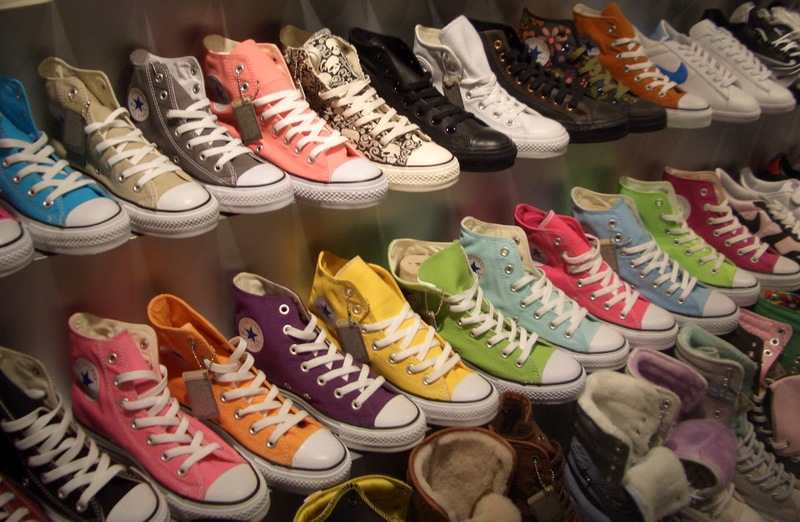 Converse, you can barely walk down the street without seeing somebody wearing a pair of these world famous shoes. Probably due to the fact they are an ideal accompaniment to everything, whether its making a fashionable outfit with jeans or taking a more casual approach to a party dress, they are a must have for everybody. Although I do not yet own a pair, they are at the top of my must have list. One of the greatest thing about Converse is the wide variety of designs they offer making their shoes a favourite for all. With their classic Chuck Taylor All Star to the special collection Dr. Seuss, they are probably one of the most versatile pairs of shoes available. Another favourite feature of Converse is that you can design your own on the official website, with loads of different patterns and colours, they can really reflect your personality. So the first one is a casual London look, something you could wear on a trip to town with the girls or an informal family get-together. The TOP, HOODIE and JEANS are from New Look (click on the word to view) and the SHOES from the Converse store, however you could find them in almost any shoe shop. Make sure you wear it with the hoodie un-zipped so there is not a blue colour block. My second is a more summery yet still casual look, maybe to wear down the beach or to a fairground in the summer. The TOP, JACKET, SHORTS and HAIRBAND are again from New Look and the SHOES, of course from the Converse store. Again wear the denim jacket un-buttoned and the hairband around the head with big beachy waves to create that perfect summery look. So what do you think? Your sure to be right with the trend if you try these out and of course add your own twist to create an outfit that represents your personality. Oh, and with prom season around the corner, converse have even released a new prom collection for the girls and guys who want to casual down the traditional prom style, which could be a good idea for all the dancing, but what do you think, too casual? Leave a comment below! 10 Reasons Why; I love Parade!